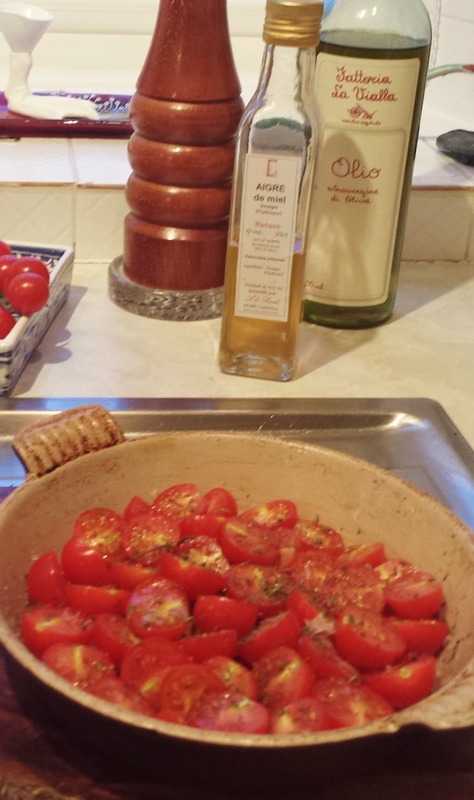 This is a quickie version of the Tomate Provençal recipe from Cooking with Adrienne, Volume I. If you are like me, towards the end of winter you are bored with root vegetables and the bounty of summer is a long way off. 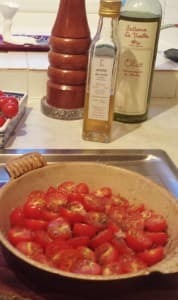 But you can brighten up your meals with this trick for boosting the flavor of winter tomatoes by roasting them with vinegar. It will definitely wake up your taste buds. It was inspired by a vinaigre de miel that I brought back with me from the Languedoc. I had never heard of honey vinegar so of course I had to taste it. The agrodolce balance in this vinegar caught me completely by surprise. Unfortunately it is not something that you can easily get outside of France. However, I tested a bunch of flavored vinegars and found that the citrus ones work really well. And if you ever find real vinaigre de miel buy it! Serve as a side to grilled fish or chicken, I think it goes really well with Sea Bass. A great way to infuse dull winter tomatoes with flavor! It is a perfect accompaniment to grilled sea bass or chicken. Step 2 Slice tomatoes in half and crowd them into individual oiled gratin dishes, or one medium gratin dish. Sprinkle with the vinegar, thyme, salt and pepper. 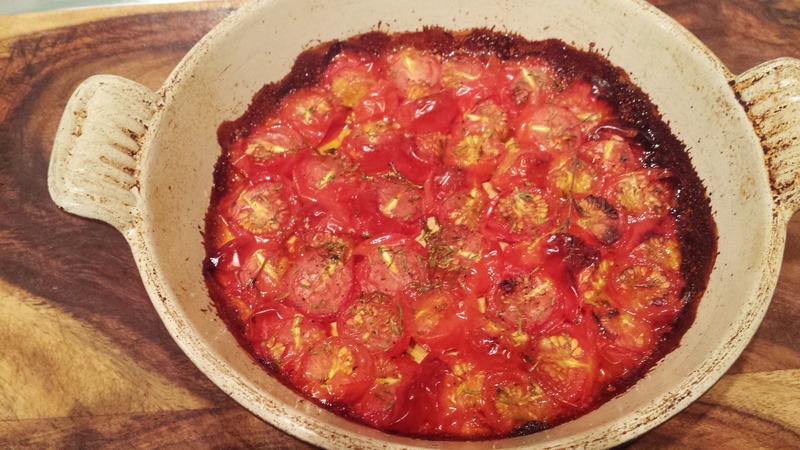 Place in the upper third of oven and roast for 20 minutes or until the edges of the tomatoes begin to caramelize. Serve immediately. A day without champagne is like a day without foie gras! I love your blog design and your beautiful images. I am a food lover and enjoy baking on weekends when time allows me to make muffins. I really love your web site, it has engaging information, Thank you! Hello, Thank you for the beautiful food recipe, It is nice to find easy to follow like this one on your food blog. I love baking bread rolls and treats for my partner in the winter months and ice cream in lovely hot summer days.